FEC claim to fully support POS solutions in hotel industry. Save your date and visit FEC USA team’s booth (#2948) in New York during NOV 13 – 15, 2016! FEC France gave "Modular Design" a new definition by showing full AerMobile series that will be launched later this month. Check how we succeeded! 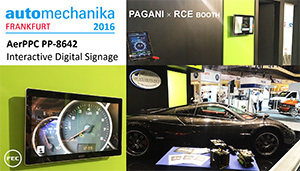 AerPPC PP-8642 was chosen to be installed as an interactive digital signage in reception center of Italian Super Car PAGANI’s booth! AerPPC PP-9635 and & customer display AP-2025 were installed in Starbucks Coffee’s 1st & 2nd stores of South Africa! 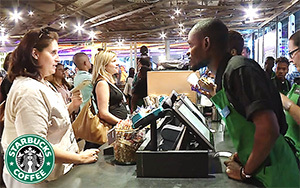 POS systems can be more than just a desktop PC or a wall mount digital signage. 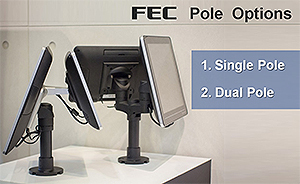 FEC offer single pole and dual pole for various requirement, flexible applications, and also beautifully present. FEC team is ready for you in Koh Samui, Thailand. The next generation of FEC POS products are all set. Let’s TAB the future and LET it shine! Copyright 2016 Firich Enterprises Co., Ltd. (FEC) All Rights Reserved. Please add fecpos@firich.com.tw to your address book and do not reply to this e-mail. It is only an automated notification e-mail. You are receiving this email because www.fecpos.com would like to inform FEC news to you. 10F., No. 75, Sec. 1, Sin Tai Wu Rd., Sijhih Dist., New Taipei City 221, Taiwan, R.O.C.